All eyes will be on Doomben tomorrow and Ballymore looks forward to saddling up two chances in feature races - Surpass in the Brisbane Cup and Merion in the Queensland Guineas. Due to be ridden by Damian Browne, Merion is looking to bounce back after a luckless run in last month's Sunshine Coast Guineas. "Things just didn't go right for him there but we have been very happy with him since," said Michael Moroney. "The track should not be too firm which will suit him and we think he will prove very hard to beat." Moroney is also looking for a bold showing from our Brisbane Cup candidate Surpass who is suited back at handicap level after contesting a weight-for-age contest at his most recent outing. On that occasion getting back in a slowly run affair over 1600m, Surpass will appreciate the distance rise and we are looking forward to seeing him take his outstanding work to the races. 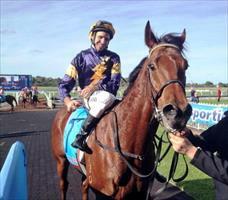 "He has been in terrific form at the track," Moroney enthused, "and he looks great." "Blake Shinn got off him last start and said he'd go close next time out - I hope he is right!" We have another very nice horse heading to Moonee Valley, Yesterday's Songs (pictured) to take his place in the Cafetto Handicap over 1509m. To be ridden by Damien Oliver, the lightly raced and promising four-year-old picked up good late ground in the Gr.1 Goodwood Handicap at his most recent outing and he is certainly going to appreciate the drop in class. "The step up in distance will suit him also," said Moroney, adding that so long as he gets around Moonee Valley he is the horse to beat. "The circuit can trip a few up but so long as he handles it he should go very close." Depending on track conditions The Bunsta may or may not race at Hawkesbury on Sunday, Moroney keen for the four-year-old to find a suitable race with the sting out of the track. "Over the short trip he just needs a bit of rain, if there isn't any we may wait for next week." Monday is the Queen's Birthday holiday and we have just the one runner, Nordic Duke at Rosehill. "He was due to run last week but just had a touch of mild colic," Moroney explained. "It was over with pretty quickly and he seems fine. It is his first attempt at the mile and a quarter but he is from a good staying family and his half-sister ran in the Queensland Oaks last weekend." Meanwhile Ballymore celebrated a winner in the UK on Thursday, the promising Bartel impressive saluting over seven furlongs at Kempton. Trained by Ed Vaughan, the son of Aussie Rules was a 38,000 guineas purchase by Paul at the 2013 Tattersall's October Yearling Sales and he looks set for better things with Royal Ascot his next destination. "He is a pretty good horse," Moroney said - "he looks like being the best we have had in the UK which is exciting."